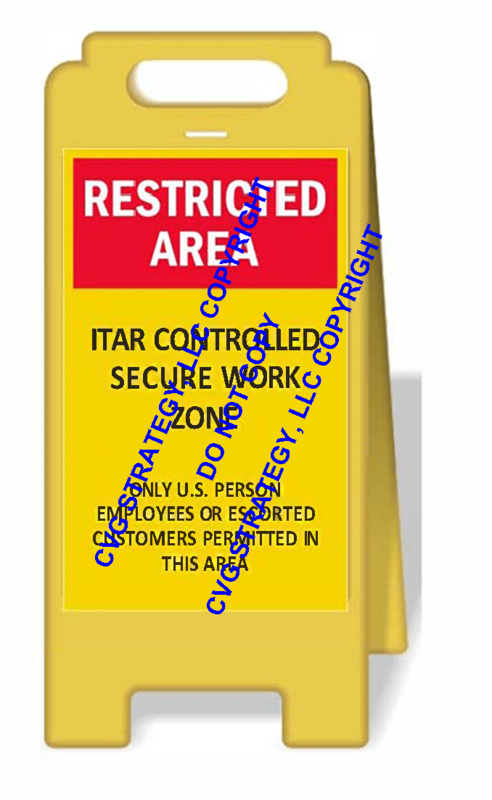 ITAR Floor Stand Sign for use to give notice in restricted areas. Durable polypropylene sign has easy grip handle. Signs are chemical resistant, high temperature resistant up to 168F and have a 10 year life . ITAR Floor Stand Sign for use for restricted areas to ensure ITAR control of your restricted areas for compliance and to be used to give notice of restricted access to your facilities. Manufactured specially for CVG Strategy, our FloorBoss XL customized 25×12″ durable polypropylene double sided “ITAR Floor Stand Sign” will last years and is suitable for indoor or outdoor applications. This”ITAR Floor Stand Sign” stands alone on the floor with an easy grip handle. The “ITAR Floor Stand Sign” is manufactured with chemical resistant injection molded polypropylene material. This FloorBoss™ “ITAR Floor Stand Sign” outlasts lightweight corrugated or flat folding signs. This “ITAR Floor Stand Sign” is used at many commercial facilities in the United States and are very necessary to warn visitors that the company is committed to ITAR Compliance and in controlling access to its buildings and operations. It should be posted near all work areas or rooms to indicate to all employees and escorted visitors that ITAR Restrictions apply to the contents or activities in that area or facility. THIS NOTICE SHOULD BE POSTED IN ALL COMMERCIAL FACILITIES WHERE RESTRICTED ITAR OR EAR WORK IS BEING PERFORMED IN ACCORDANCE WITH US GOVERNMENT REGULATIONS PER THE DDTC.